Hedges are great both for the environment and for offering privacy in an aesthetically-pleasing way, in fact, the only downside to them is the need to keep them trimmed and the higher you allow your hedge to grow, the more of a challenge this can become. Manual hedge trimmers were, quite literally, a pain to use, even when they were properly sharp, thankfully, however, we now have power hedge trimmers to take up the strain and save our shoulders. What’s more, there are even long-reach hedge trimmers to deal with the highest of hedges. Manual hedge trimmers essentially work like oversize scissors. Even though they’re now completely outdated for serious trimming, it can still be handy to have a pair in your shed for tidying up your hedge between proper trims. Power trimmers look and behave similarly to light chain saws. Long-reach hedge trimmers are basically power hedge trimmers with a telescopic handle to allow you to reach the highest branches without a ladder. First of all, you want a blade which is between 40cm and 60cm long. This is long enough to be able to tackle a hedge in meaningful chunks, but still short enough for the average person to manoeuver it fairly easily, even using a telescopic handle. Secondly, you want a long-reach hedge trimmer to have deep (prominent) teeth. This is arguably even more important for a long-reach hedge trimmer than for a standard hedge trimmer. The reason for this is that the whole point of a telescopic handle is to extend your reach, which means you’ll essentially be trimming “blind”. This means that you need to be able to trust your long-reach hedge trimmer to be able to cut whatever comes its way without you having to get on a ladder to help it out. Thirdly, and for essentially the same reason, you also ideally want an adjustable head, basically you want to be able to set it at the perfect angle just to glide smoothly across your hedge without any further input from you. Last, but by no means least, you need your long-reach hedge trimmer to be comfortable in use. It really is impossible to overstate the importance of this. The whole point of using a long-reach hedge trimmer is to make your life easier (at least with regards to hedge trimming) so it would be rather ironic to swap out a manual hedge trimmer, or even a power hedge trimmer and a ladder, for a long-reach hedge trimmer only to discover that you couldn’t use it comfortably and ended up going back to using your old tools. When you are using a standard hedge trimmer, the weight of the motor is close to your body. When you are using a long-reach hedge trimmer, the weight of the motor is at the end of the handle, which can make it feel a lot heavier, especially if you are using a cordless long-reach hedge trimmer and even more so if you are using a petrol long-reach hedge trimmer. Most high-quality long-reach hedge trimmers will come with a shoulder sling to help with this and it’s strongly recommended to use it. Younger people will probably find they can use long-reach hedge trimmers just as easily as standard hedge trimmers, but older people may really feel the difference in weight. The best way to address this is just to accept it and plan to trim your hedge in short bursts rather than extended sessions. You may be very pleasantly surprised by how much work you can get done with a good long-reach hedge trimmer even in a short time and buying a good long-reach hedge trimmer is certainly more affordable than paying someone else to cut your hedge for you. Like standard hedge trimmers, long-reach hedge trimmers come in three variations: corded, cordless and petrol. Each of these types has its advantages and disadvantages. Even though the world is going wireless, there’s still a place for corded long-reach hedge trimmers, especially for older people and/or people who have smaller gardens. They’re light, quiet, fairly powerful, very consistent and often more affordable than either cordless long-reach hedge trimmers or petrol long-reach hedge trimmers. They also work on a “plug and play” basis instead of needing to be charged before use. Using a residual current device (RCD) is highly recommended as it protects against receiving an electric shock if the cable is cut. The obvious attraction of cordless long-reach hedge trimmers is that they don’t have cords. The obvious drawback to cordless, long-reach hedge trimmers is that this means you have to remember to keep your battery charged and accept the fact that there will be a limit to how long you can use a cordless long-reach hedge trimmer between charges (although these limits may not bother you in the least and if they do you always have the option to buy a spare battery). Cordless long-reach hedge trimmers are heavier than corded long-reach hedge trimmers (because they have to hold a battery) but they are much lighter and easier to use than petrol long-reach hedge trimmers. They are the least powerful than either corded or petrol long-reach hedge trimmers but high-quality long-reach hedge trimmers, like the ones in our list of recommendations, will be perfectly adequate for the average home gardener. Petrol long-reach hedge trimmers are large, noisy and heavy, making them physically challenging to use even with a shoulder sling. They need a lot of maintenance, are magnets for dirt and create the challenge of storing their fuel safely. You also need to make sure you use the right type of fuel (most petrol long-reach hedge trimmers run on two-stroke fuel but some run on four-stroke fuel). That’s the bad news. The good news, and the main reason why people still want to buy petrol long-reach hedge trimmers, is that they are far and away the most powerful long-reach hedge trimmers you can buy and can tackle the hedges which would make corded long-reach hedge trimmers struggle and make cordless long-reach hedge trimmers give up in despair. In short, if you have tough hedges to cut on a regular basis, then, for all their issues, a petrol long-reach hedge trimmer may be the only sensible option. We’ve divided up these reviews into three groups: corded long-reach hedge trimmer reviews, cordless long-reach hedge-trimmer reviews and long-reach petrol hedge trimmer reviews. The criteria for inclusion, however, are essentially the same for each group, which is to say a combination of quality, reliability and value for money. Black and Decker surely needs no introduction. It must surely be one of the best-known brands in the home- (and garden-) maintenance sector and this corded long-reach hedge trimmer is everything you would expect from them, which is to say a solid performer at a reasonable price. 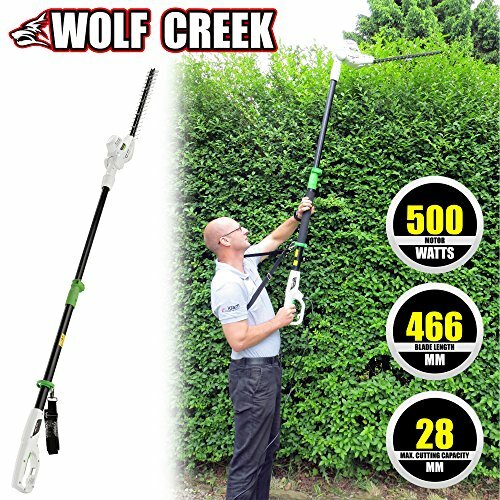 Please note that we’re recommended this specific long-reach hedge trimmer from Wolf Creek, rather than its predecessor. Both the older model and this one do a very capable job on hedges, but this newer model is noticeably lighter than the previous one and still offers the same level of cutting performance. It’s not quite as powerful as the Black and Decker long-reach hedge trimmer but it is definitely lighter, so you have to pick your priority. Even though the Bosch cordless long-reach hedge trimmer has to hold a battery as well as a motor, it only weighs 3.6Kg. This means that you can’t really expect it to handle really unruly hedges but if a hedge is in reasonably good shape, it will maintain it with ease. To put this in perspective, even though the tooth clearance is 16mm, in the real world the maximum branch width the Bosch is likely to be able to handle comfortable is about 12mm and even then, ideally, only on an occasional basis. On the other hand, even an older person is likely to find the Bosch to be easy and comfortable to use, especially if they are working on a “little-and-often” basis. Speaking of little and often, in the real world, the battery is likely to last about 30 minutes in standard use. There are two key points you need to note about the Ryobi. The first is that it only appears to work well if you use genuine Ryobi batteries, rather than generic ones. The second is that this is a fairly hefty piece of kit and so probably better suited to fitter, younger adults, rather than older people. 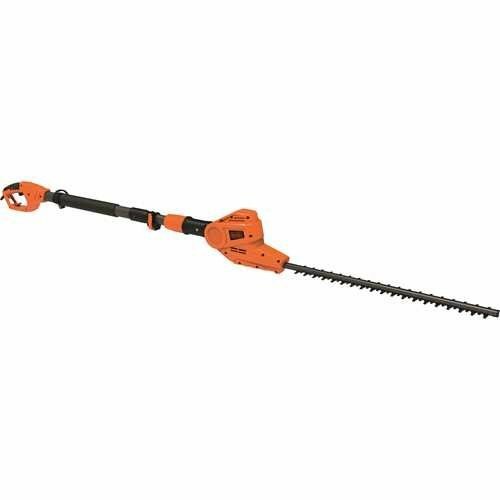 Having said that, the reason it’s so hefty is because this is one powerful cordless hedge trimmer can tackle the likes of blackthorn without complaint. Although the VonHaus isn’t technically the lightest of the cordless long-reach hedge trimmers, it does feel like it, which we have to assume is something to do with the way it’s designed or perhaps it just reflects how easy it is to use. As you might have guessed from this it’s the least powerful of the cordless long-reach hedge trimmers on our list, but it’s still more than adequate for many hedges, especially if you keep them trimmed regularly, which you’ll find much easier to do with a good long-reach hedge trimmer. Delivers up to 10,000 rpm, 4,200 spm, 1.03 hp and speed at maximum output power of up to 7,000 rpm. 13 angle settings (11.25 degrees each) through 135 degrees. Folds 180 degrees – built-in clutch can stop blade even if throttle is pressed when folding. 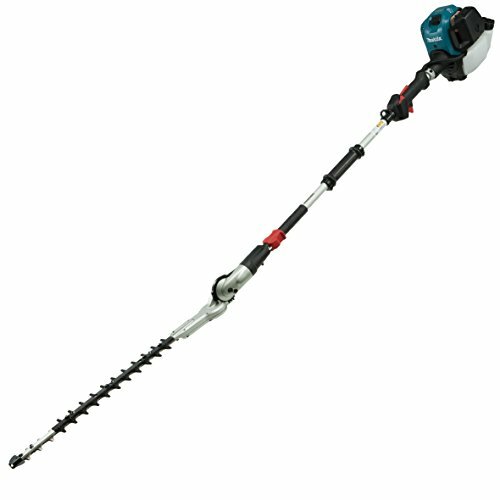 All we can say about the Makita is that it is an absolute beast of a long-reach petrol hedge trimmer and, to be fair, is about as comfortable to use as you can reasonably expect for this kind of tool. The Webb is a long-reach petrol hedge trimmer for the rest of us. It has enough power to deal with tough hedges and its anti-vibration system does make it a bit more comfortable over extended use. As we generally say, the “best” telescopic hedge trimmer is the one which best suits your needs and wants. We’d suggest that you start by deciding whether or not you need the sheer raw power of the petrol trimmers. If you do then the Makita is the most powerful option with the greatest range of functionality, but it might be rather too much for even a larger home garden, in which case, the Webb could be a good option. If, however, you think an electric long-reach hedge trimmer is adequate for your needs, then you need to chooses between a corded long-reach hedge trimmer and a cordless long-reach hedge trimmer. 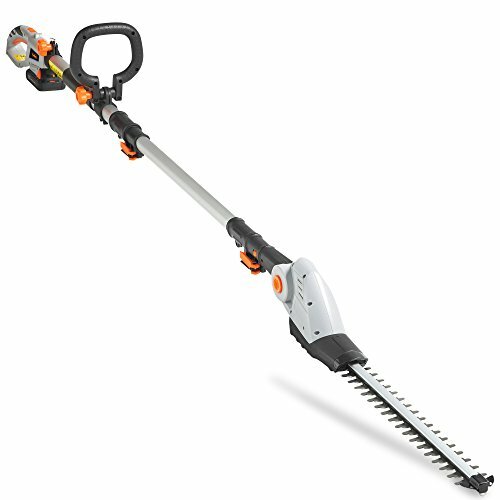 If you prefer the “plug-and-play” lightness of the corded long-reach hedge trimmers, then the Black and Decker has the edge on performance but the Wolf Creek is noticeably lighter. If you prefer a cordless model, your choice will basically boil down to whether you prioritize maximum power or maximum ease of use. The Ryobi is the most powerful, but also heavy, whereas the VonHaus has a reduced level of performance, but is much easier to handle. The Bosch sits in the middle of the road, offering a balance of performance and ease of use.